I have witnessed voice teachers in the past saying things like “I don’t hear any nodules, so you’re fine,” “I can give you some therapeutic exercises that will heal your vocal damage,” or “My diagnosis is you have a polyp and need some vocal rest.” These kinds of comments are always quite concerning to me. 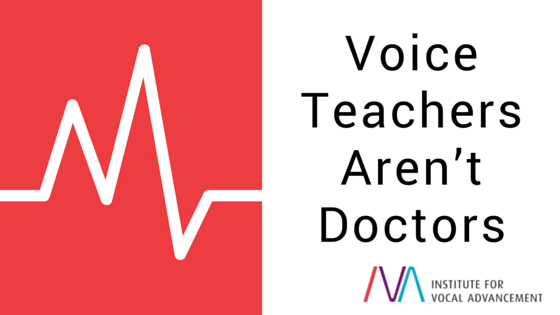 While a voice teacher may have some medical knowledge, a voice teacher (unless otherwise licensed) is not a doctor, and therefore is not qualified to diagnose or treat any medical condition, including that of the voice. Most voice teachers who have been teaching for several years have had experience working with singers who have a vast array of conditions, so it is understandable that, after a while, it can seem like we know what we are talking about when it comes to disorders of the voice; however, it is an egotistical and potentially dangerous practice for any voice teacher to ever attempt to diagnose or treat a medical condition. In my own studio whenever I hear something that sounds like a particular disorder to my ears, I immediately recommend they see a laryngologist who is well trained to work with singers. The doctor can then use the latest diagnostic procedures and technologies in order to determine what is actually happening physiologically in the voice. Then, based ONLY on the suggested treatment protocol of the doctor, am I willing to proceed with the singer. I will usually go the extra step and actually contact the doctor myself so I’m clear as to what he or she recommends should and should not be done in regards to my role, as a singing teacher, in working with the student. While it’s true certain vocal exercises can have amazing therapeutic effects, I recognize I am not a therapist, I am a voice teacher. Only within the confines of the protocol a doctor has outlined, am I able to recommend vocal exercises to a student who has been suffering with a disorder of the voice. Please remember, a voice teacher who suggests any type of diagnosis or treatment of a voice disorder is NOT qualified to do so (unless they happen to also be a licensed physician). Any student who is worried they have a disorder of the voice, should get him or herself to a laryngologist’s office. I know many voice teachers have incredible credentials. Many have written books, teach university classes in vocal science, and perhaps even have the letters Ph.D. after their name. All of these things are wonderful, and can make a huge difference to their ability to teach singing; however, only a licensed physician can diagnose and treat any kind of disease or disorder. 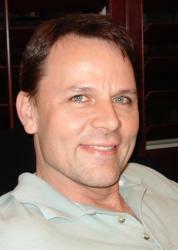 When it comes to your voice, every singer must be very careful about who they let “treat” them.